Mo. 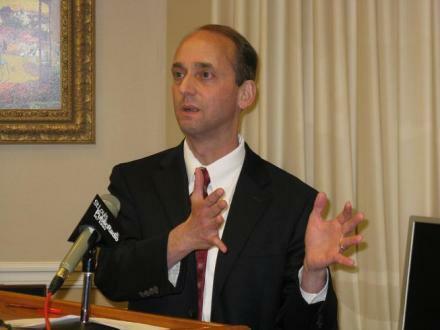 State Auditor Tom Schweich. A follow-up report from state auditor Tom Schweich finds that the small North County municipality of Pine Lawn is making progress in solving ongoing management issues. Schweich conducted the original audit, released in June 2011, at the request of Pine Lawn citizens. It rated the city's overall performance as poor. Auditors found, among other things, $1.4 million in delinquent trash fees that were not being pursued, poor budgeting practices, and problems complying with the Sunshine Law. The follow-up released today found that Pine Lawn officials had either implemented, or were in the progress of implementing, eight of the recommendations made in the original audit. The city indicated that it would not implement the 9th, which called on the mayor to retain mileage logs for a city car that he also used to commute from home and for the city to report that benefit on his tax forms. Officials told the auditor that the personal commuting mileage was too small to be reported.